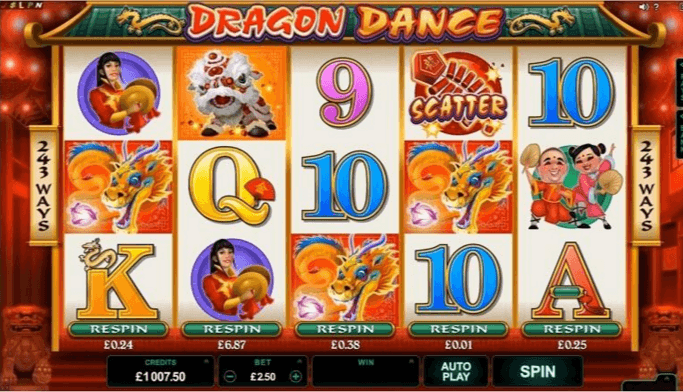 Ladies and Gentlemen, welcome to play this fantastic video slots which is proud to be called Dragon Dance. The amazing theme of this video slot is based on Chinese New Year festival so if you have never seen or heard about bombastic Chinese New Year, this is the once in a lifetime experience for you to see it straight from your home! You get to play this video slot with 3 rows and 5 reels and you have incredible 243 different ways to win huge prizes. In this game you have 2 bonus features. First one is unique Re-spin feature which gives you a chance to re-spin a selected reel as many times as you want to get the winning combination. There is an extra cost for every re-spins which are said underneath the each reel. This fantastic feature gives you a chance to control the slot a little bit more. You have also chance to win 15 free spins if you manage to get 3 or more firework Scatter symbol on the reels. All of the wins during this feature are tripled. And this is not all. Another 3 Scatter symbols retrigger 15 Free Spins again.